Looking to add a spooky flair to your table or mantle? 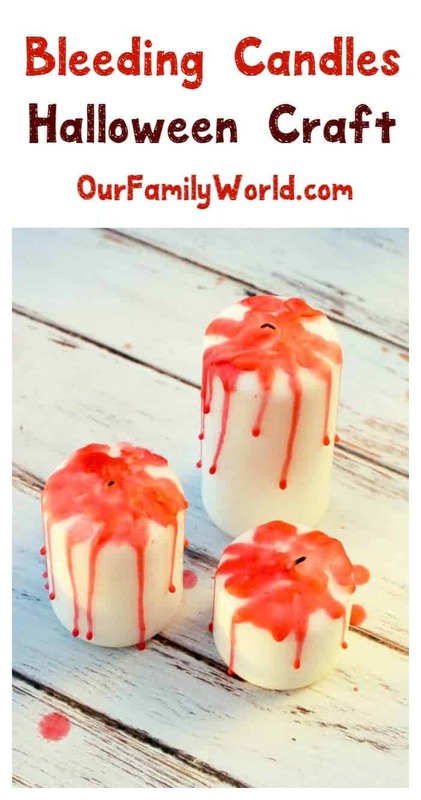 Our fun DIY bleeding candles Halloween décor craft is super simple and cheap to make! I don’t know about you but I love being able to buy a couple of things and create my own décor rather than pay a lot of money for a finished product that basically did the same thing I did. It makes me feel like I one-upped “the man.” When I can get away with paying $3 instead of $15, I feel like I got away with cheating the system. Honestly, I’m not sure what system but it feels good either way; I’m sure you know what I’m talking about, don’t try and deny it. Anyways, it’s that time again to start dreaming up all the creepy stuff you want to decorate your house with. I settled for a tiered set of bleeding candles. Here’s how I did it! First of all, I got those tiered candles at Wal-Mart for a little over two dollars. They came packaged in the tiered set already and I know that’s common. Begin by setting these three candles up and spreading them apart a bit. Next, like your dark red candle and hold it over your first white candle. Be sure to get the dark red candle because I got a lighter red and it didn’t quite have the true bloody feel I wanted, although it still worked. Allow the red wax to drip on each white candle. 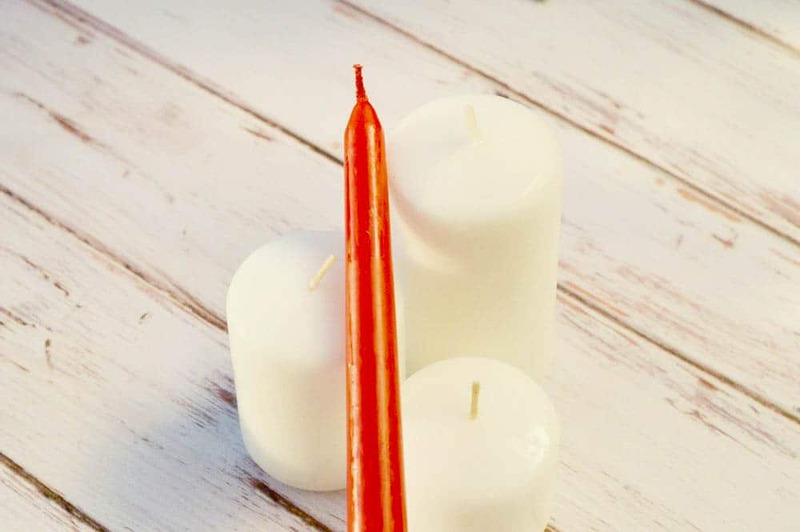 Start from the top and make sure around the wick is covered in red wax and then begin allowing the wax to drip further down until it’s rolling down the sides. You may have to use the tip of the red candle to nudge drops of wax over the edge. There’s really no wrong way to do this so have fun dripping everywhere! Looking for more fun Halloween ideas? Stay tuned, because we’re just getting this year’s party started! We’ll be back all season long with recipes, crafts and all the cutests costumes! In the mean time, check out 5 Easy Peasy Halloween Wreaths that you can get started on right now! What are your favorite ways to decorate for the season? Do you have any favorite DIY Halloween decor crafts? Share in the comments! Wow! 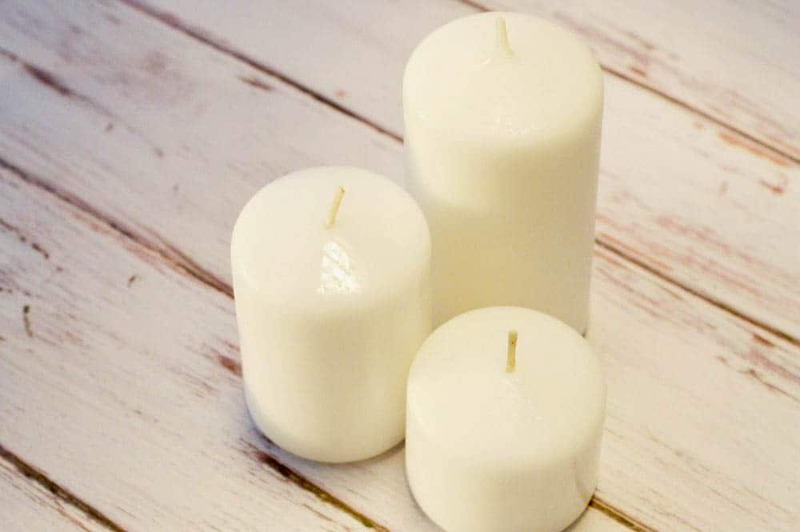 These candles are so easy to make, and the effect is better than I expected! Great DYI article, thank you very much for the idea! So easy peasy is right! I’m very frugal, so this is one of those DIY crafts I will definitely be doing this year. Would be great to do with my daughter! What a great idea. 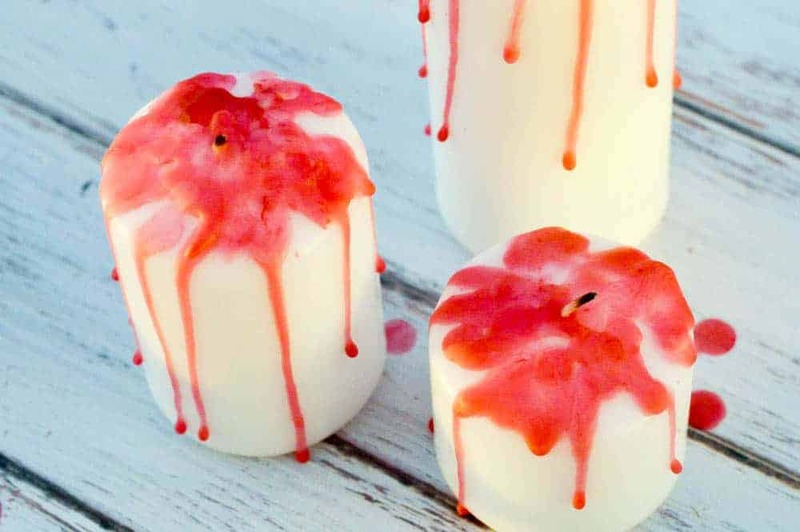 These Halloween candles are so easy. This is such a cool craft! The “blood” look is perfect for Halloween. I’ll have to make these for our house. What creative ideas for the holiday. I haven’t seen that one before. I absolutely love Halloween and these candles would work perfectly. No need to spend a lot of money on something so easy to do.